This my personal Jaaxy keyword Tool review. Jaaxy is an advanced keyword tool built for internet marketers. Use Jaaxy to the most relevant keywords in your niche or brainstorm ideas using the latest trends identified in the major search engines. Finding the best keywords for your blog or website is smart business. if you do not have relevant keywords in your website content, people will not find your website. By relevant, these are keywords that correspond to the search phrases people enter into a search engine query. Consequently, the search engines will not display your website in the results. Keywords determine how much free traffic you get. Keywords help define your target market. Businesses and marketers compete for popular keywords. Finding low competition keywords that generate traffic helps with your business profitability. 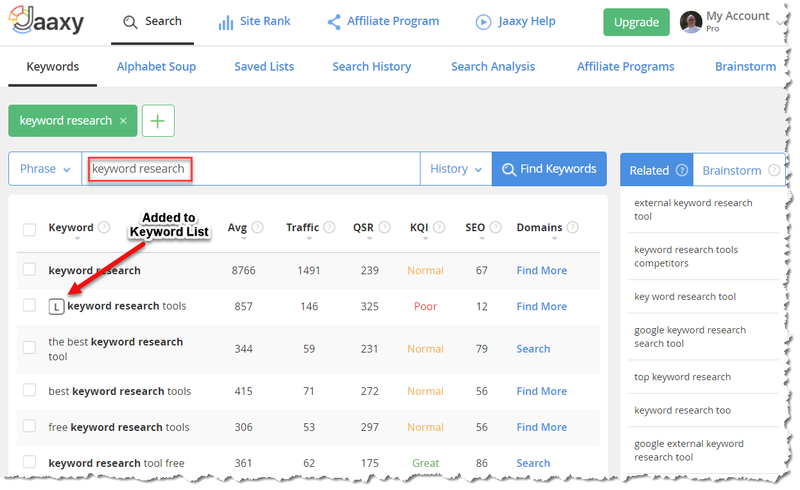 Does the Jaaxy Keyword Tool Work? Here are two current screenshots showing the #1 Google ranking for my keywords. The first screenshot is from the Jaaxy Site Rank query. The second screenshot is the results of the SEMrush domain query. Jaaxy is a subscription-based keyword research platform. Jaaxy has a number of functions that take it well beyond a basic keyword tool. Keyword Alphabet Soup Search - finds keywords using the Google word auto complete such as keyword + "a", keyword + "b" and so forth. Saved Lists - stores saved keyword lists with ability to export the files in txt or csv format. Search History - shows keyword search history from current to oldest. Search Analysis - finds top 10 detailed Google, Bing, and Yahoo listings by keyword searched. Affiliate Program Search - finds affiliate programs in CJ, Digital River, Clickbank, and Link Share by keyword. The results show the affiliate program name, product website URL, sales commission rate, Alexa ranking, and affiliate network. Brainstorm - shows trending keywords by popularity in Google Trends, Alexa Topics, Amazon Best Sellers, and Twitter Trends. Site Rank - this query by keyword and URL shows site ranking in Google, Bing, and Yahoo search engines. Keyword – A phrase or words that users type into search engines to find something. In this case, our search term is “keyword research tool.” The "l" identifies the keywords that I saved to a keyword list for later use. Average – The average number of searches the keyword receives per month for that keyword on Google, Bing and Yahoo. This example shows our search term has an average of 291 searches a month. Traffic – Visits to your website if you achieve first page rankings in the Search Engines. Quoted Search Results (QSR) – The number of competing websites ranked in Google for this exact keyword. The lower the number, the less the competition. Jaaxy is a great Google keyword tool for this reason. Keyword Quality Indicator (KQI) – Great is green, Normal is Yellow, and Poor is Red. Search Engine Optimization (SEO) – A score based on traffic and competition, the higher the score, the more likely you will rank for this keyword on the first page (scale of 1-100, higher=better). The following bonuses are included within the Jaaxy training. Jaaxy has three plans; free and two paid plans. 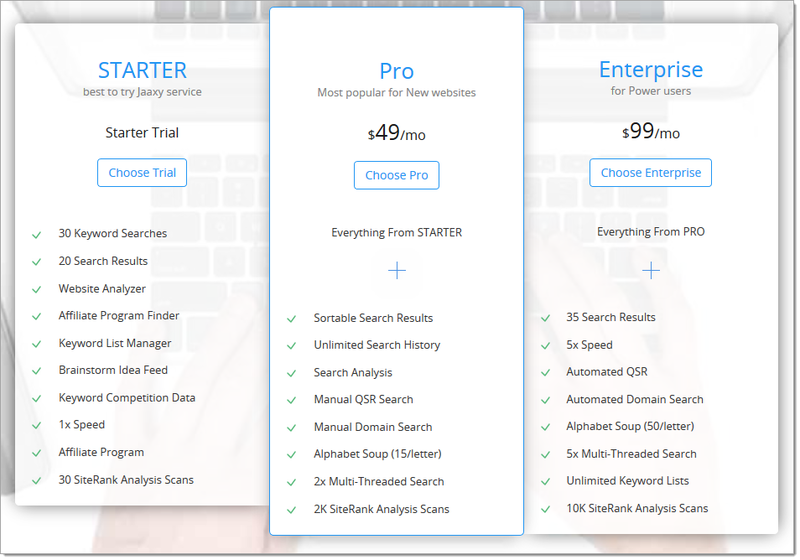 For someone just starting out, the free trial is a good introduction to keyword tools. The free trial gives you 30 keyword searches. I took the middle road and personally use the Pro version to research keywords for my content marketing efforts. The Enterprise subscription is for power users who know and understand the importance of keyword research. Jaaxy is a great keyword tool to help you bet the competition. But I don’t believe there is a single one tool fits all purposes or budgets. Soovle - Provides search suggestions and completions from the top providers, not just search engines, on the internet. Sources like Wikipedia, Answers.com, Amazon, and others. Soovle is easy to use, fast and efficient. Google Keyword Planner – If you want keyword research results, you can go to the biggest source there is. Google. As part of the Google Adwords paid advertising system, it is one of the most popular, if not the most popular research tools available. The Google Keyword Planner is simple to use by starting your keyword list building by searching by word, phrase or category. You can apply different filters such as countries and date ranges to further target your data. SEMrush – SEMrush is a premium keyword research tool. But SEMrush does offer a 30-day free trial. SEMrush goes a step beyond just finding the best keywords. 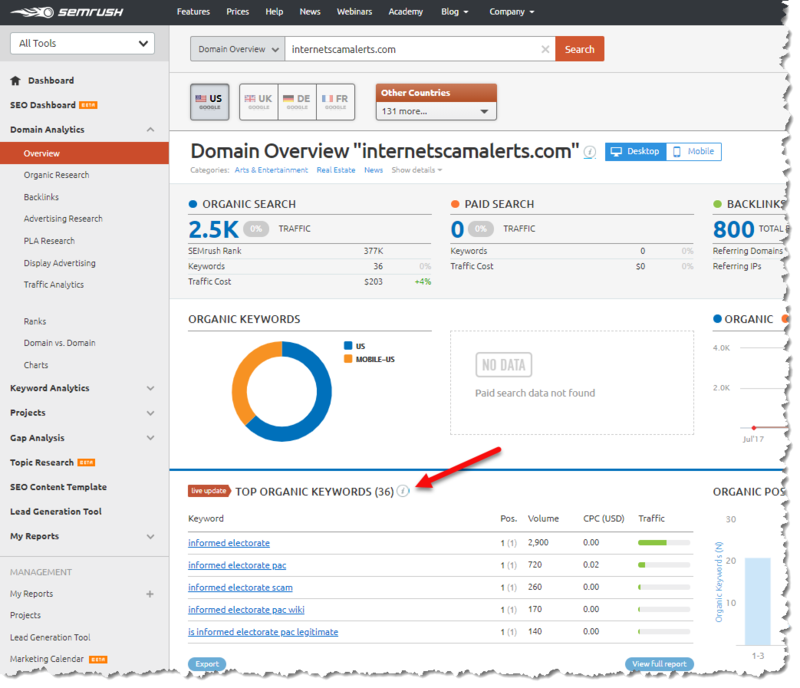 SEMrush also provides keywords your competitor sites use. It gives you the ability to track and analyze the keywords your competitors are using. SEMrush offers one of the most complete research tool sets available. Long Tail Pro – Users are able to create hundreds or thousands of unique keywords. Long Tail Pro provides information related to keyword competitiveness as well as competitor analysis. A big advantage to using LTP is how quickly LTP returns large amounts of data. LTP uses a proprietary algorithm that measures the competitiveness of keywords. Long Tail Pro offers a 10-day trail period for $1. InstaKeywords – InstaKeywords is a free keyword research tool. Upgrading to a premium account opens up additional features such as competition analysis scores. The screenshot below shows the search results which includes global and local searches as well as Cost per click (CPC) information. The competition data was covered since I used the free version. AnswerThePublic – AnswerThePublic is all about understanding the question a searcher is asking. 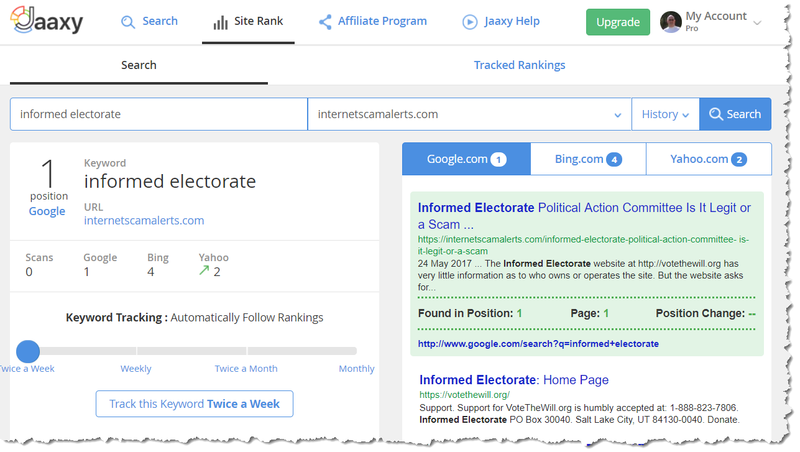 AnswerThePublic provides research data from Google and Bing search engines. The data is returned in the form of likely asked questions either in visualization form or tabular as shown in the examples below. I like using Jaaxy keyword tool. It gets me results. And it has all the functionality I need to do keyword research, keyword and competition analysis as well as brainstorm new ideas for my website content. If you have any questions or comments about the Jaaxy Keyword Tool, please fill in and submit the form below. I love feedback.